Aligarh: As Aligarh Muslim University (AMU) geared up for the Sir Syed Ahmad Khan’s Bicentenary celebrations, Professor Mohammad Asim Siddiqui from the university’s Department of English and Dr Rahat Abrar, the Director of Urdu Academy, AMU set out on a project for paying tributes to Sir Syed in a unique way. The result of their efforts is a vibrant photographic and historical census of Sir Syed’s life and works in ‘Jahan-e-Syed’, a coffee table book which features photographs alongside quotes of Sir Syed and anecdotes from his life. 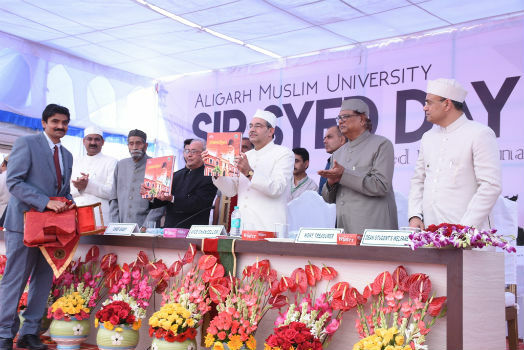 The book was released by former Indian President, Shri Pranab Mukherjee and AMU Vice Chancellor, Professor Tariq Mansoor during the Sir Syed Day commemoration ceremony. ‘Jahan-e-Syed’ is a celebration of Sir Syed’s individuality and a eulogy to the spirit of his mission. This book tries to see Sir Syed’s life and works through some rare photographs and images. Short and crisp essays at the beginning of each chapter and highly readable extracts from Sir Syed’s books, essays and speeches explain and interpret the photographs. The book brings into sharper light the various facets of Sir Syed’s genius as a writer, a thinker, a social worker, an administrator and educationist. It also explores the historic phenomenon of the awakening of the Indian Muslims to the challenges of modernity and it shows how Sir Syed sensitized Indian Muslims to Western education and modernity, which, in turn, inspirited them. ‘Jahan-e-Syed’ has a foreword by AMU Vice Chancellor, Professor Tariq Mansoor and introduction by Prof Mohammad Asim Siddiqui. It also presents views on Sir Syed by great reformers and intellectuals such as Jawaharlal Nehru, Lala Rajpat Rai, Dr Rajendra Prasad, Tara Chand, Sir Auckland Colvin, Shyam Benegal and Ramchandra Guha among others. The book has been published by Times of India Group.